No, this is not a Game of Thrones post. While many of us are waiting for the series finale, most anglers in the northern US are waiting for ice to form on our favorite lakes and ponds. This is just a few short months from the time of this articles’ writing. For some anglers in areas where ice fishing is possible, they have opted not to try for one reason or another. If you’re looking to get into ice fishing, there is some bare minimum ice fishing equipment you need to get started. I know you realize you can’t show up with just your tacklebox and favorite rod, but you may not think about everything, like a good ice fishing sled, various ice fishing tackle and even ice fishing shelters. Here is some ice fishing equipment you should have at a minimum to be able to safely, successfully, and comfortably fish on the ice this winter. Make sure you look to see some of the best ice fishing gear you can find on Amazon. You can also find what is considered to be the best ice fishing reel for any angler. Check out some of these cool ice fishing shelters when you get a chance. It might give you inspiration to look at one for yourself! The most obvious first step in ice fishing is breaking through the ice. I suppose you could try fishing above the ice but you’d end up with a long, slow, cold day. In order to break through the ice, anglers need a tool to help drill deep, sometimes over twenty inches of ice. The tool of choice is a powered ice auger. Most ice fishing anglers would prefer a powered ice auger when they get on the water. For one, it can be really tasking drilling just one hole by hand. Two, imagine drilling eight? Needless to say, while it is the more expensive option of the two, for a couple hundred dollars you can drill all the holes you may need in a morning and be ready to fish in no time. There happens to be three types of powered augers that are popular on the market today. First, is the traditional gas-powered auger. For instance this Eskimo Ice Auger is a great choice. 33cc powered engine will make sure you have enough torque to push the auger bit through the ice. And with a nice, clear gas tank you can see just how much gas you have for the day without having to twist off the cap. This auger is outfitted with an 8-inch bit which is the standard hole size for most tip ups. It’s a great choice at a reasonable price. You can also look at a terrific Southland one man auger if you need a little more power. Runs on readily available 1lb. propane cylinder. Quick-release bottle holder. The other combustible engine ice auger is powered by propane fuel. This one is gaining in popularity because the high compression of propane fuel can release a little more power from the same engine. They tend to also be much easier to maintain than their gasoline counterparts. No need to prime before you start up the auger and start drilling. I like the idea of not having to mess with a liquid fuel especially if you need to refill on the ice. If you’re by yourself you run the risk of spilling fuel onto the ice which isn’t the most environmentally friendly you can do ice fishing. Plus, anything that may provide more power is always a good thing. Eskimo also makes a High Compression Auger that makes sense if you want to use a really easy to maintain Auger. They’re a little more expensive but over time they should be worth it. 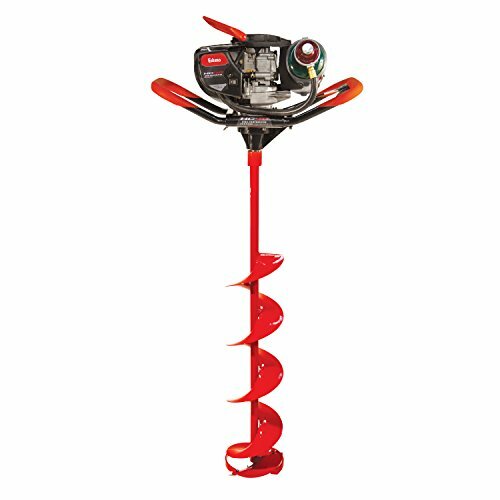 There is a big trend in powered augers that is making a lot of anglers take notice, especially anglers just starting to get into ice fishing. Electrically powered ice augers are the new big thing and I can understand why. Lighter, cleaner to run, and instant power make an electric ice auger like the Ion pictured an attractive option. This auger is only 21 pounds so if you’re walking your way to your favorite spot, you’ll be thankful you’re not lugging anything heavier. Plus, with advancing battery technologies, this auger will drill up to 40 holes in two feet thick ice on a single charge. More than enough power to fish all day without worry. A fantastic option but keep in mind these are more expensive. Obviously as technology improves and battery costs go down the cost to buy one of these will follow. But for now, expect a higher price but a really attractive option unless you prefer the more traditionally powered augers. If you’re new to ice fishing, which is the point of this article, think hard about your budget and make a point to include a powered auger in it. I understand they’re a considerable expense but if you’re just starting out, the one thing that can turn you off from ice fishing faster than anything else is how long and hard it will be manually drilling through the ice. 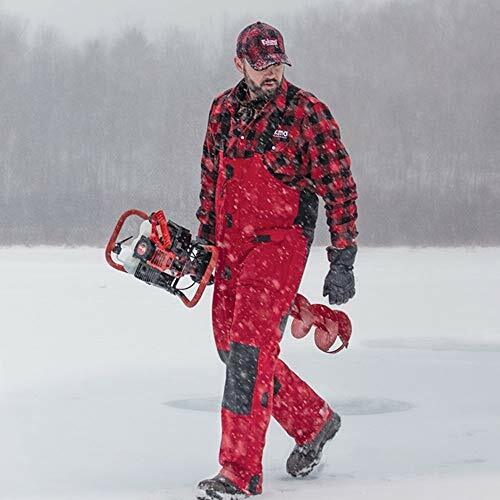 Pick a good one from the options above or check out my article on electric ice augers that include converting your cordless power drill into one. And if you need more convincing, below is a video of an angler mimicking “open water” conditions by drilling a large rectangular area. It’s a pretty cool video so be sure to check it out! As previously mentioned, it’s not recommended that you pick up a manual ice auger if you really want convenience. However, if you’re on a limited budget and would like the exercise, a good manual ice auger is sufficient to get you fishing. There are a few brands out there and you might find one cheaply at your local sporting goods store, but two brands I recognize as being leaders are Strikemaster and Eskimo. The Strikemaster pictured above I consider to be your best choice. Prices vary depending on size but its simple construction and design make it an obvious choice. It’ll definitely drill a nice hole through the ice for you and unlike the other options, it’s only going to run out of power when you run out of power! It’s also built with an adjustable height, from 47 to 56 inches which means you can drill in just about any thickness necessary. If Strikemaster doesn’t work for you, you can also check out the Eskimo hand Auger. It’s another good option that varies in price based on auger bit size. So you were able to drill a nice hole in the ice. When you pull out the auger, however, that hole looks like the top of a frozen drink and not even close to ready to fish. This is where the second most important piece of ice fishing comes to play. When a hole is drilled, you now need to clear it of the ice debris with an ice skimmer. Some people call them ice ladles, because that’s what they look like. Whatever suits you is fine, but you need one if you want to fish. There are a ton of options out there and really all of them are pretty good. I personally would go with the Celsius Telescopic Ice Skimmer, though. It’s biggest feature is the handle is extendable up to three feet. I will tell you, if you buy a standard, non-telescopic ice skimmer, there will come a time where you may have to get your hand in the water just to clear the hole completely. With this you should save yourself from getting wet and still get the hole clean and safe for your fishing line. Definitely give the Celsius Telescopic a hard look before you decide on any others. Now that your hole has been drilled and ice debris has been cleaned, you can actually start to fish. There are several ways to ice fish, believe it or not. The most popular method is using a tip up, where a spool of line hangs from the bottom of a contraption, in the water, and when a fish strikes a flag that was set releases indicating a fish is on the line. The angler rushes to pull the tip up out of the water and handles the fish with his hands until bringing it to the surface. This method has been tried and true forever. The Frabil Tip Up is a really good option. It’s ruggedly built, especially to withstand subzero temperatures, and while it’s a little pricier compared to the wooden options you typically see, it’ll last for a long time. Simple setup and use makes it a great tip up to buy. Celsius makes a wooden tip up and offers it in a 3 pack if you need multiple tip ups at a great price. Check it out if you’d like to be a little more traditional. The other method for ice fishing is to use a mini rod/reel combo. This is great if you want that typical feel of fighting the fish on a rod and reel. You can set it up essentially the same way as a tip up but now you have the luxury of fighting the fish without handling the line by hand. There are plenty of options out there for rods and reels when ice fishing. We will be covering both options extensively in future articles. However, for the time being, and because you’re new to this experience, you should start and end your search here. Ugly Stik has always been a quality rod at a very reasonable price and Shakespeare does make some of the better budget reels out there and is a sister brand to my favorite reel, the Pflueger President. To pair with your reel and rod, if you want to have it set up with a flag while you watch and wait, pick up one of these rod and reel tip ups. For a beginner in ice fishing, you really don’t need to stress about what line you’re going to use. Braided, monofilament, fluorocarbon, it really all depends on what your application is. I’ve gone into detail on this subject elsewhere but the basic gist is match the line for the type of fish you plan on fishing for. Fish that rely on sight will be sensitive to thick, visible lines. If you choose to use a braided line, like the Sufix 832 Ice Braid , tie a decent sized leader to it with either monofilament or fluorocarbon. Otherwise pick a good mono or fluorocarbon line and call it a day. I could list off dozens and dozens of options here for good tackle and lures, but that would only confuse matters and honestly it all depends on the types of fish you’re fishing for. Generally if you’re ice fishing you’re targeting certain types of trout and salmon, pike or muskie, walleye, perch, bass, and crappie and maybe a few other species. Unfortunately the spread on those species is so vast that you can’t just select one bait to catch them all. I will have separate articles talking about the best lures for specific fish so be sure to check for those down the road. For now, as a beginner, let’s make this as simple as possible. Pick up a pack of Gamakatsu live bait hooks in the appropriate size and at your nearest bait shop, pick up whatever live bait they sell. Minnows are always good. Some locations use smelt, which would be a good option too. You can even use worms if you choose. I would highly recommend you work with live bait as you’ll be able to catch something with live bait especially on your first few trips out. So that’s basically all you need to get started. I’d suggest a few other things to keep you comfortable. Below is a list of “nice to have’s” but not requirements in my eyes. But, keep in mind, this is all assuming you already have the appropriate clothing to keep you warm- good boots, snow gear, gloves, hats, etc. Nothing is more important than staying safe on the ice and there’s few places colder than on the middle of a frozen lake. Dress appropriately! Now check out these other cool items to have with you for a fun day of fishing! Coleman Foldable Chair – Light and easy to travel with. Much easier to sit than stand the entire time! Clam Ice Shelter – If you really want to be comfortable, Clam makes a variety of sized ice shelters to protect you from the wind and elements. They can be expensive but set up is a sinch and a break from the wind and snow can be priceless. [Amazon box=”B000ZKPHDU” title=”Terrain Sport Sled”] – Pulling a sled on the snow makes life way easier than hauling it all on your back. This sled gives you enough room to store just about everything so you can pull all your gear and neatly carry it wherever you go on the ice. Some ice shelters come with a sled and chairs so check those out if you want something a little more high end. Ice Flasher – If you really want an advantage on the water, pack with you an Ice Flasher. These are fish finders using the flashing technology. We will cover this in greater detail in another article but many anglers consider flashers a must have especially if you’re bound to go from spot to spot. [Amazon link=”B000P9GZSW” title=”Portable Propane Heater”] – A portable propane heater is a good idea to help keep you warm, but use with caution. They should not be left unattended especially in an enclosure. Follow all safety precautions and instructions when using. Ice fishing is a lot of fun and can be a rewarding experience. A simple search on YouTube will show you thousands of great videos of anglers hauling massive fish from beneath the frozen surface. For a beginner it can be daunting to figure out what you need for a successful outing. We think this ice fishing gear list will be just the right primer for the novice ice fishing angler. Enjoy your time out on the ice, be safe, and tight lines!